As I have mentioned before, we eat salmon quite frequently, and so I am always open to different ways to prepare it. 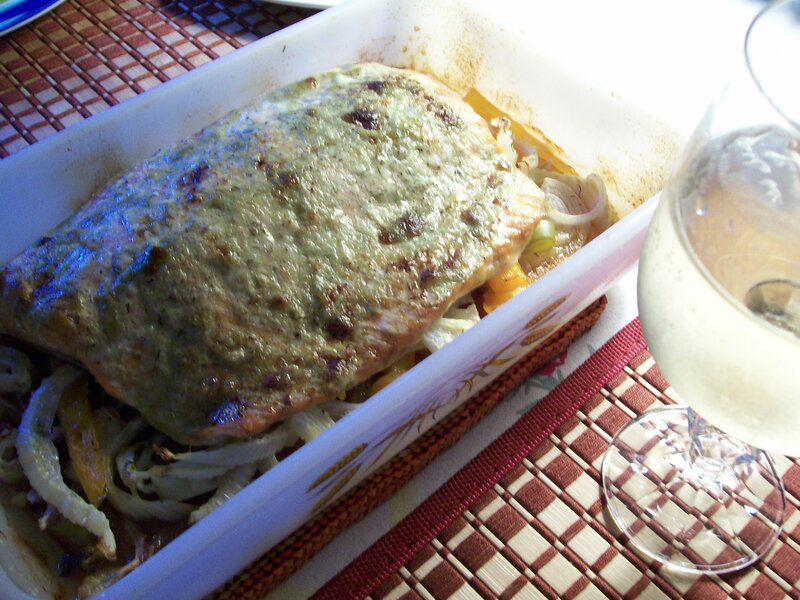 This version of salmon was prepared for me and my husband last summer by a family member whom we were visiting. We thought it was delicious: crispy around the edges, while remaining moist inside, and baked on a bed of vegetables that consisted of strips of multi-colored peppers and sliced onions. Potatoes baked in the oven along with the fish, and a green salad made a complete meal with very little “hands-on” time. I have cooked salmon this way several times since last summer and each time I vary the vegetables depending on what is available. One vegetable I really like is fennel. I think it is an under used vegetable. It is delicious raw in salads with its faint anise flavor, but when it is cooked that flavor is not noticeable . It is most like cooked celery, and blends very well with other vegetables, particularly onions. When I made this dish most recently, I combined peppers with fennel and onions. In an effort to save time and labor, I purchased a mixture of red, yellow and orange pepper strips from the grocery store salad bar. This is a dish that goes together without a recipe, so there are no exact measurements. This is how I proceed; adjust amounts to your taste. 1 medium fennel bulb, stalks, fronds, and core removed; thinly sliced. Preheat oven to 400 degrees. Spray a baking dish with baking spray. I used a 7″ x 11″ pan, whatever your salmon will fit into. 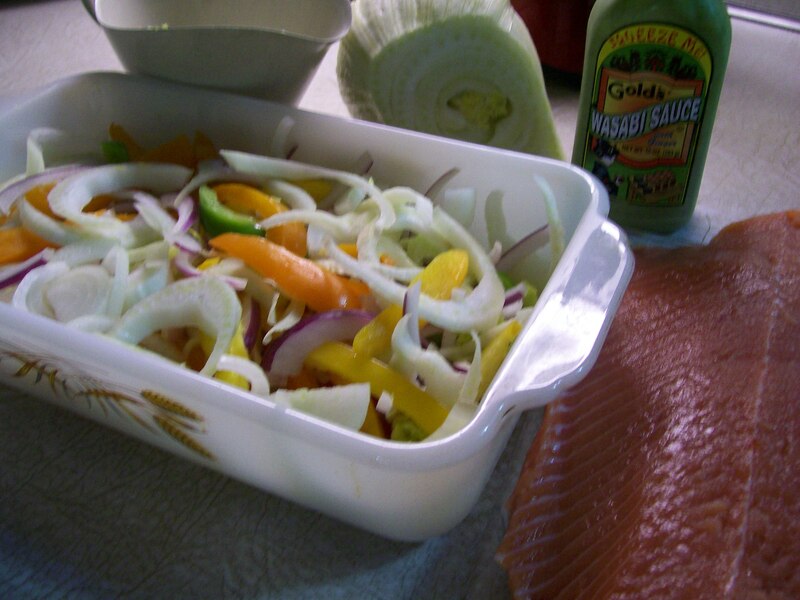 Layer the peppers, onion and fennel in the baking dish. Sprinkle with salt and pepper. Drizzle melted buyer over the top. 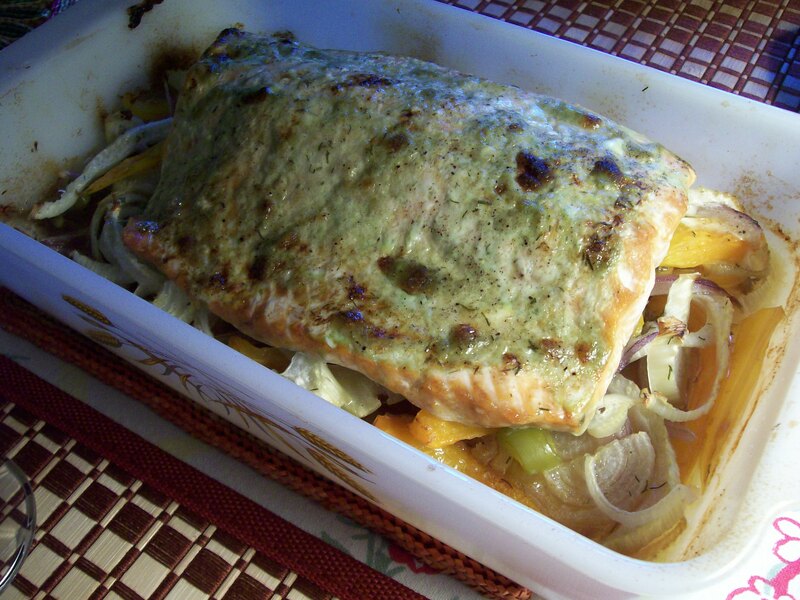 Lay the salmon fillet on top of the vegetables. Sprinkle with seafood seasoning, about 1/2 teaspoon. 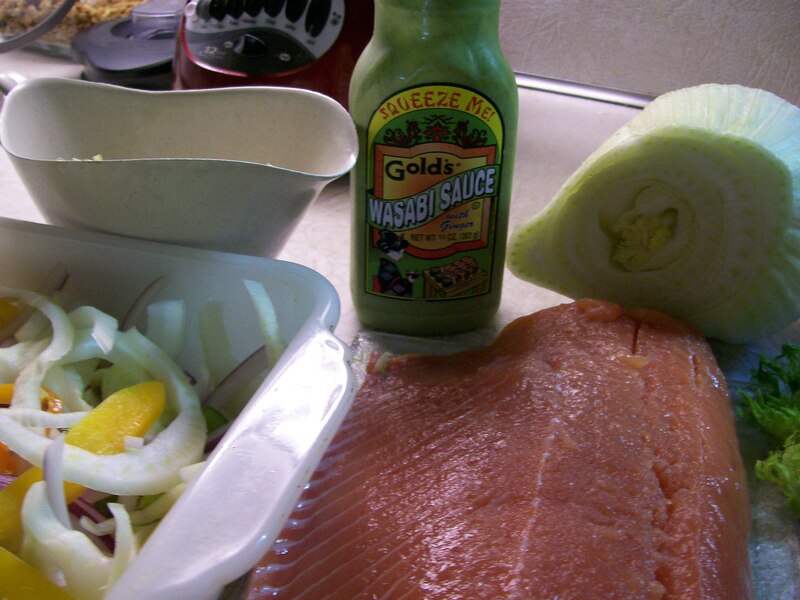 Then “frost” the salmon with the Wasabi Sauce so its pretty well covered. 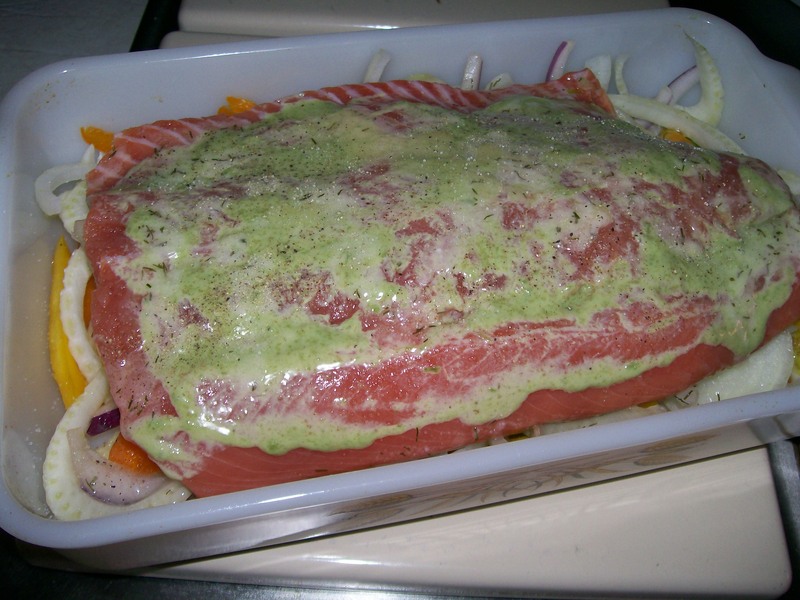 Place in a 400 degree oven and bake for 45 minutes – 1 hour, depends on thickness of your salmon fillet. Test at 45 minutes by piercing with the tip of a knife. If fish flakes easily its done. Vegetables should be tender. A glass of crisp Chardonnay goes very well with this dish!